Automatically fill-out forms just like an end-user would. You can easily download and upload of text, images, files and web pages, handle PDF files, or take screenshots. Import or export data to and from web applications using CSV & XML files, databases, or any other source. Update Excel and Access from the web. iMacros eliminates the tedious repetition of checking the same sites every day, remembering passwords, and filling out web forms. iMacros is the only form filler that can autofill web forms that stretch over several pages. All information is stored in human-readable, plain text files that can be edited easily. Passwords are stored securely with secure 256-Bit AES encryption. Read more. iMacros can also perform tasks that are the exact opposite of form filling, such as: finding and extracting text (prices, product descriptions, stock quotes, etc.) and images from websites. iMacros includes full Unicode support and works with every language, including multi-byte languages such as Chinese. Read more. Use iMacros for functional, performance, and regression testing of web applications. iMacros is the only tool that can automate in-browser tests with Internet Explorer, Firefox and Chrome. It is also the only tool to perform in-browser tests of Java, Flash, Flex or Silverlight applets and all AJAX elements. The built-in STOPWATCH command captures exact web page response times for every step of a process. Additionally, the macros can be converted to Selenium WebDriver code. Read more. 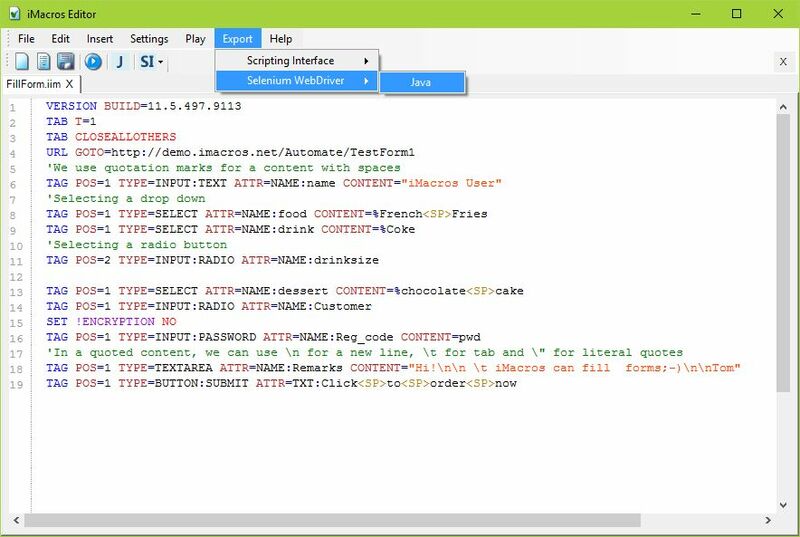 The iMacros Scripting Interface gives you full programmatic control over the web browser, so even the most complex tasks can be scripted, and there is no scripting language to learn. 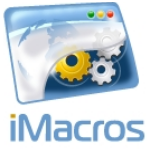 Use the 32/64 bit iMacros API to remote control the iMacros Browser, Internet Explorer and Firefox. Read more. Available for purchase as a separate product, the iMacros WebBrowser Component for .NET makes it easy to quickly add web automation to your applications. You also get a proven technology that has been tested and debugged for more than ten years and is used in over 500,000 installations with Royalty Free distribution. Easily automate functional, performance, and regression testing across any website technology including Java, Flash, Flex or Silverlight applets and all AJAX elements. iMacro built-in STOPWATCH command you can capture exact web page response times for every step of a process. Perform in-browser testing across all major browsers including Internet Explorer, Firefox and Chrome. 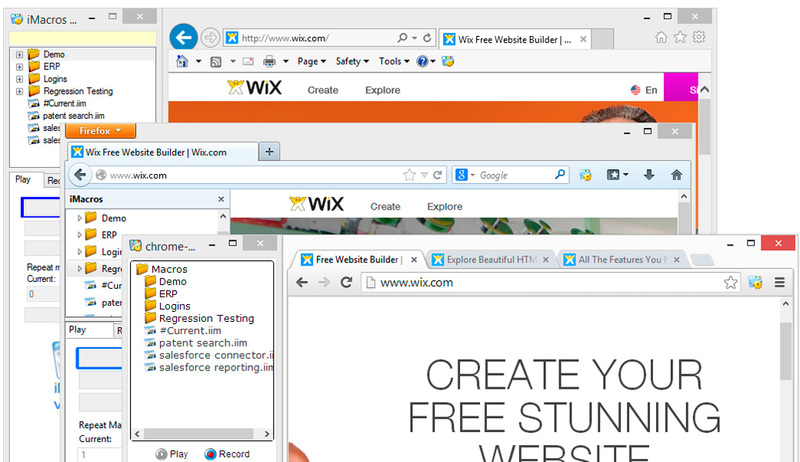 Test cases created in Internet Explorer work in Firefox and Chrome – and vice versa. Multi-threading operation, you can run up to 50 separate instances of iMacros at the same time. Find out if a certain word exists on a web page to trigger further action (like saving the web page, printing the page or running the next macro). If the keyword does not exist, iMacros retries the keyword search automatically every second until a timeout value is reached. If the keyword is still not found, iMacros reports an error. The automatic retry makes web testing websites with AJAX easy. For standard websites, you can also combine a keyword search to wait until a page changes. Built-in support for table-driven testing with its ability to read all csv formatted files (tables). No additional coding or scripting is required. You can use any numbers of columns, and all kinds of column content is supported (including full Unicode support). The number of table columns is automatically detected. Powerful recorder and convert your macro code to Selenium WebDriver Java code (QA automation) directly from the iMacros Editor. Use any flavor of iMacros (for Chrome, Firefox, or Internet Explorer) to record elements on a webpage and then easily export the commands to Java Selenium code using this feature of the iMacros Editor. Passwords are stored securely with secure 256-Bit AES encryption. Web Automation with Image Recognition - use images instead of cumbersome X/Y coordinates. Update Internal Systems - with the latest exchange rates and stock-market quotations. Interface with Online Databases - Supports online databases and websites sites like Amazon, Ebay or salesforce.com. Automate Ajax Testing - using standard HTML based TAG commands. Automate Form Data Entry - Automatically enter data in online forms, on a regular basis or only when triggered by another program or script. Automate Web Upload/Download - Control the browser (via an API) and automate upload/download of data via a local, Intranet or Internet web interface. Integrate Business Data - price, quantity, item name, description, etc., from a supplier’s website. Integrate with Excel - Upload data from a spreadsheet to a website, or populate an Excel sheet with data from a website. Extract Pricing Data - Extract online pricing data from a competitor's website, subtract one cent and add it to your online store.